Mattie Sade, the Overseer’s in-house propagandist, only meets Hope in Episode 3, but she makes up in mystery what she lacks in screen-time. République writer Brendan Murphy answered some fans’ questions about Mattie’s origins and background. 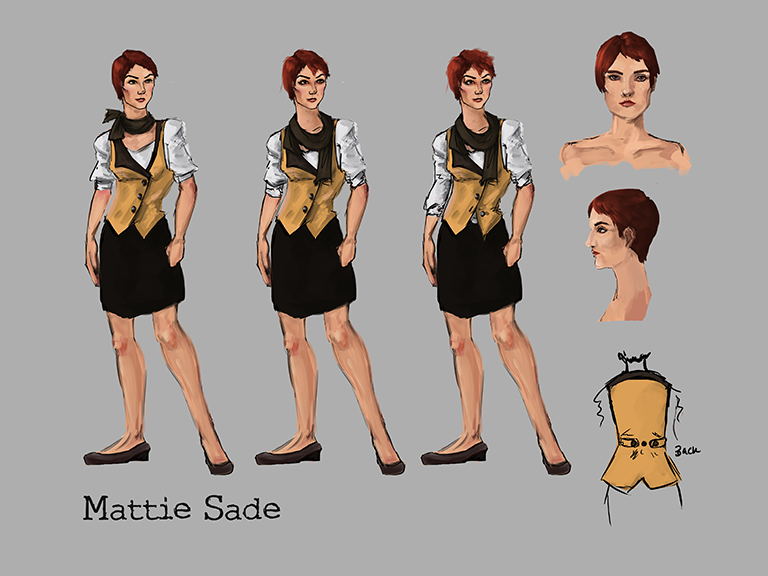 Q: What was the inspiration behind Mattie Sade? Murphy: For République, we wanted a journalist who represented the state—someone whose sole job was to protect the people in power. Mattie Sade is a propagandist, the opposite of a true journalist. If you scramble the letters in her name, you get “State Media.” That’s who she is. Q: How did Mattie come aboard Metamorphosis? Murphy: There are some audio logs in Episode 3 and beyond that offer glimpses into her backstory. Mattie always had a shaky relationship with the truth—she liked a good story better than the facts. The Overseer promised her an opportunity to run a news organization where facts didn’t matter, which was an offer she couldn’t refuse! Q: Why did the Overseer scout her, specifically, for his propaganda machine? Murphy: Before bringing her into his employ, the Overseer read an article Mattie wrote which attacked one of his political enemies. He liked Mattie’s cutthroat style and admired how gracefully she danced around the truth. Q: Why did she have a change of heart regarding Hope? Murphy: A lot of people trapped in Metamorphosis arrived there voluntarily. When they saw what was really going on—the worst of it—they instantly regretted their decision. Mattie made a career out of spinning lies to sell newspapers, and she was corrupt beyond saving, but she couldn’t abide what was happening to Hope. Plus, an escaped Pre-Cal makes for quite a news story, depending on how you spin it. Q: Mattie has access to a lot of information in Metamorphosis. How much of Hope and the player’s activities did she know before Hope arrived in her office? Murphy: Mattie knew a Pre-Cal had escaped. She probably wasn’t monitoring Hope’s every move, as it all happened over the course of one night. Still, Mattie wasn’t surprised when Hope tiptoed into her office. Q: Where is Mattie at the end of République? Murphy: Mattie’s pretty wily. If Metamorphosis fell in the end, she probably made it out of there. If she had to face criminal justice for her complicity in all of it, I think she probably talked her way out of that jam, too. Mattie Sade always lands on her feet, even after a bottle of wine.